What’s your family secret —the one you want no one else to know, the one you’ll take to your grave? Most families have secrets held from even other family members. Maybe it’s a child out of wedlock, a half brother in a faraway country fathered by a G.I. in WWII or a love child with an unnamed father. The secret is kept until death, and only then the story emerges as the survivors go through the deceased’s papers. That’s exactly what happened to Detroit native Steve Luxenberg, author of “Annie’s Ghosts: A Journey Into a Family Secret,” which has been selected as the Great Michigan Read for 2013 by the Michigan Humanities Council. Luxenberg said he decided to tell what he calls “a universal story,” one that many believe is ”better off left unwritten.” He said he firmly believes that every family has a secret that needs to be aired. “The consequences of secrecy roll down into subsequent generations,” he said. He said since his mother was dead, he saw no downside to revealing his family secret. He hopes that by writing about his journey to explore the secret and its roots that other secret keepers will release what they have been hiding. He also said he wanted to shine a light on the shame of mental illness that we still carry more than six decades after his aunt was sent to a mental institution to be forgotten. “Annie’s Ghost” is more than a memoir; it is an investigation into the mental health system and how Luxenberg’s aunt ended up institutionalized. It is also about how, in the name of secrecy, it is nearly impossible to delve into the process that saw her end up at Eloise. Luxenberg launches a statewide tour in Lansing at the Michigan Historical Center at 7 p.m. Tuesday. 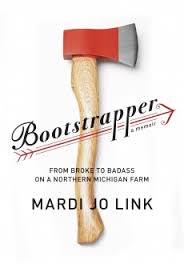 He will be joined by another Michigan author, Mardi Jo Link, whose new book, “Bootstrapper: From Broke to Badass on a Northern Michigan Farm,“ tells about her life as a divorced single mom raising three boys. Link admits to writing about what might be called “family secrets,” but she’s quick to point out that she let her boys read the manuscript before publication. “The Great Read program is a unique opportunity to get Michiganians reading the same book at the same time, discussing important social topics like mental health, interacting with Michigan authors, and considering our shared ideas of what it means to be part of this great state,” said Erik Nordberg, executive director of the Michigan Humanities Council. Learn more about the Great Michigan Read here. And check out the statewide tour information here. Reservations are recommended for the 7 p.m., Tuesday, September 24 kickoff event at the auditorium in the Michigan Historical Center at 717 West Allegan, Lansing Michigan.